Oceanfront studio Condo. Sleeps 3. Queen bed & Queen sofa bed. Just twenty feet from the ocean, this remodeled studio condo has a spectacular Lanai for dining, entertaining, or lounging. It is huge, perfect for viewing the turtles that feed below and the whales during the season. 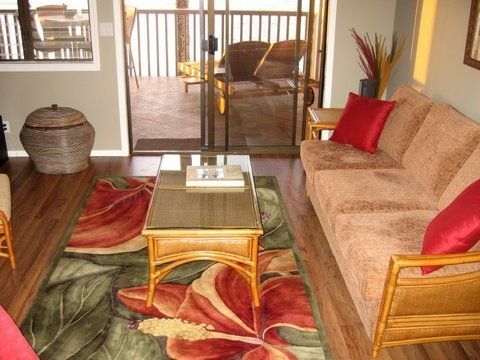 Located minutes from Lahaina, Kaanapali Beach and Kapalua. A short jog along quiet Lower Honoapiilani road gets you to Napili beach and the beaches at Kapalua. Golf at Kaanapali, Kapalua or one of the many courses close by. Surf, snorkel and swim in the ocean at your doorstep. Or just read a book on sandy Kahana beach located adjacent to the property. The property has two private pools, a tennis court, clubhouse, air conditioning, DSL, and on site washer/dryer. It's walking distance to a wide variety of dining options from fine cuisine to pizza. Go out for dinner or grill it on one of the barbecues. You will also enjoy free on site parking. You won't need to bring a beach towel, those are provided, too, as are beach chairs and a small cooler for the beach. (Sometimes the beach chairs and cooler need to be replaced; we do that every time we are on island). Hawaii Excise and Transient tax #WA41918595-01. Having been in the travel business for 30 years, The Hawaiian Island was our speciality. We were married on the Big Island and managed a timeshare on Kauai and Maui. Once the timeshare expired, we purchased the condo from the Owner/Builder of the Pohailani Complex. It has been remodeled with Tiled bath, Lanai, hardwood floors and complete kitchen remodel. As previous stated, we purchased our condo from the owner/builder of the Pohailani Complex. We love the location of West Maui. It's close to the many activities Maui has to offer and the Oceanfront location makes it spectacular to view the beautiful sunsets from our huge Lanai. It's like a seperate room with a double lounger. Whales off your lanai during the winter December-March and watch the Turtles that feed below from the Lanai. Walking distance to everything you need and minutes by car or bike to the best beaches and golf on the islands. Condo is literally 20 Ft. Off the oceanfront. View turtles feeding below and Whales during the season. Covered free parking with a designated space. We also provide BEACH towels so you don't have to pack those big bulky things. We also provide a cooler, beach chairs, umbrella, snorkel gear and more! Full fridge with ice maker. Full fridge with ice maker. Full oven/stove and microwave. All kitchen utensils, pots and pans for cooking. Serving platters,dishes,glasses, coffee mugs, glasses, coffee maker. Breakfast bar seats three with views of ocean. Also, dining table for four on the lanai. Lawn area in front of the condo right on the ocean with lounge chairs. Very private. Not like many nearby condos. Feels like your home, not a busy resort. Rental located within walking distance. We provide limited snorkle gear. But shops are minutes away and within walking distance. You will need a mask to come eye to eye with the turtles right in front of the condo. Tennis court, two pools, washer/dryer on property site, clubhouse, free on site parking. We enjoyed every moment of our stay here. Beautiful place with a wonderful view. We loved having coffee and watching the whales and turtles. Thank you Michael for your awesome review. We really appreciate nice reviews and our returning guests. We like to think that our condo is the best unit on the oceanfront. It was purchased from the owner/builder of the Pohailani complex. We had the most amazing stay here at this condo. Everything was exactly as the pictures show. We were able to walk to many places for dinner and if not there are so many places within driving distance (or Lyft & Uber). The space was just enough for two people. Plenty of items to cook with, fridge, dishwasher & utensils. The AC unit was great! The lanai was stunning, we spent 90% of our time out there. The sunsets here are gorgeous. Every morning we saw whales in the water. We saw many sea turtles right along the edge of the wall. On our last day we even saw a double rainbow. The grounds were very quiet and well kept. I appreciated the double lounger and the table outside as well. We spent a lot of time at that table! The unit has beach chairs, snorkel gear, noodles, a cooler and towels - making going to the beach pain free! The parking space was not an issue at all for us, we had a BMW and it fit just fine. We loaded things in the trunk and i hopped out before my husband parked, easy! It was hard finding a place to stay being from NH and never having been to the island, but this place is a true slice of heaven. Thank you for sharing your home and allowing us to experience the beauty!!! Thank you Abagail for your amazing review. It really means alot to us. We remodeled our condo hoping that our guests would have the same experience as you. This time of year is perfect to see the whales and the sunsets from our lanai are amazing. We hope to have you as our guests again! The description and photos of this property are spot on. The condo was beautiful, clean and well stocked. If it were any closer to the ocean, you would be in it! We especially appreciated all of the "special" touches such as beach chairs, beach towels, cooler and much more. You can tell the owners care about their property and it shows. We highly recommend it and hope to return again some day! Wonderful condo with incredible views from balcony!! We loved this studio condo. The view from the balcony at sunset was amazing!! The chaise and table on the balcony made for very comfortable dining and lounging. Being here in late December we were able to see whale activity in the mornings and fish jumping out of the water to escape the turtles that feed right in front of the balcony, and on our last day, the most vivid rainbow after a storm passed. Access to the water is a short 100 yards away. The condo has all the amenities needed for cooking, but we couldn't find the pots and pans. A quick call to the management office led us to cabinets under the bar where we found everything needed!! The bed is comfortable and there was always plenty of hot water. Beach chairs, boogie boards, snorkel equipment, and a cooler were also provided. The only downside is the parking space under the stairway. Our rental was a Ford Mustang and we couldn't park and open doors to get out. The management company allowed us to park in one of the guest spots and the problem was solved most of the time. This was a minor inconvenience in an otherwise incredible stay. Thank you, Matt, Georgene, & Tim, for sharing your home with us. Thank you so much for the wonderful review. It means so much to us that our guests enjoy our condo as much as we do. We hope to have you back soon. Our condo is oceanfront and minutes by car to some of the highest rated beaches and Golf such as, Kaanapali, Napili and Kapalua. Historic Lahaina town and the Old Lahaina Luau is worth a visit. There are also many 5 star restaurants in the area. A day trip to Hana has beautiful views, waterfalls and Haleakala Crater for the downhill Bike and a visit to the Maui Winery at Ulupalakua Ranch. Cancellations Policy $50.00 Cancellation Fee. Non Refundable for cancellations made 60 days or less prior to arrival. Travel insurance is encouraged. No refunds for early departures.